Oya is truly a mysterious force of nature, manifested in the bolts of lightning and in the wind. 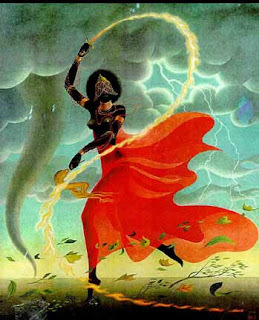 The moments when the wind takes hold announcing thunder and lightning is the dance of Oya in the world. Her praise names are amongst many Oya Orire, she who’s beauty is so great we cannot look away, Oya Oriri, ‘the charming one’, Aféfé lèlè, ‘great wind’, Afèfé ikú, ‘winds of death’. She is also Aféfé légé-legé tí í dá’gi l’okè-l’okè, ‘the wind that severs the treetops’ and Ìyáàmí arina bora bí aso, ‘My mother who dresses in fire’. Her name is probably an elision of O Iya Mesan, meaning ‘Mother of Nine’. This epitaph refers to the nine children she begot with Sango. The first eight were mute, but the night spoke with an outlandish high pitched voice. The ninth child was Egúngún. Oya is the wind that turns into fire. An object in rapid movement will generate heat, and as such the movement of Oya generates heat and fire, resulting in the thunderbolt. She is the wind that dresses the fire. But wind, the aerial element is also a reference to the spiritual domain, to the corporeality of spirits which are of air and wind. This association will tell us that Egúngún is the wind within the earth, the one that speaks like the wind. The wind is the portent of the empyrean wisdom. It is here we find the link between ancestral wisdom and what is hidden within the earth. This is why we place our heads to the ground and ask from Onile what we need to stay strong and ardent. He who listens is Egúngún, the ancestral memory – the sub-terrestrial wind. He is this because the wind is spirit, it is the memories not only in the ancestral mind, but it is also the portal to the divine mind. Wind upon wind, layer upon layer, nine in all, which is the dress Oya carries. Oya cuts the treetops; because the trees are our ancestors and she descend upon the crown of trees as the vinculum of divine inspiration. Her womb is the gateway of wisdom. She is the wisdom that flashes through the sky and ignites immediate understanding. She is the wisdom that makes us humble and by this we fall to the ground. As we lye there with our back to the ancestral winds murmuring underneath she flashes in the storms above us – She is wisdom and this is why Sango desperately needs her, like the Egúngún mediums need her touch to speak. Sango as the rustic politician needs wisdom. He needs the spark of inspiration to walk with his thunderous presence. He needs the voice of reason dawning upon him as a white cloth from Orisa Nla. Oya is ‘the charming one’, because she can seduce the mind. She is the wind of death because she is divine justice. She is the wisdom of equilibrium resting on the shoulders of Egúngún. She is the womb that invigorates the earth and wind to speak its wisdom. Eepaa Oya!